The Brussels Griffon is Cheerful, friendly, but sometimes may moody. and affection to his owner. (rough coats), Belgian Griffon (Rough of other colors), Petit Griffon (smooth coat). This breed's ancestry is unknown, they were became a companion dog in the house. They were first shown at the Brussels Exhibition of 1880. Somewhat rare, Griffons may be very difficult to find. The Brussels Griffon is a toy dogs. They comes with two varieties of coats, which are smooth and rough. The variety of rough coat is wiry, harsh and dense hair. The smooth coat is glossy, straight, tight, and short. The coat colors comes with black, red, tan and black, black an red mixed, or solid black. The socialization and obedience training should start from a young age. They may be wary of strangers, so that the socialization training should let him meet different varieties of human which can help him to accept new people. This breeds of dogs is intelligent and bright so makes they quick to learn the new commands. The Brussels Griffon training should train with consistency, firmness and fairness. Make the training with fun always to keep this dog's attention. A gentle but firm handler would work best with training. The smooth coat is very easy to groom. Should brushing with a soft bristle brush twice weekly. However the rough coat will need twice weekly brushing as well to keep the coat clean always, shiny and to prevent any tangles and matting. This breed requires a lot of maintenance on the rough coat. The coat of dogs may be clipped. 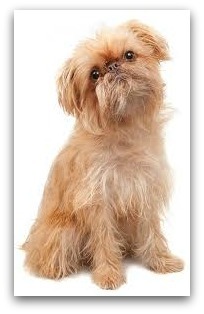 The Brussels Griffon sheds little to no hair at all, is very suitable for those to allergy to dogs. Brussels Griffon companion dog does not do well when left alone for long hours, he need someone whose can always spend a lot of time with her, it is not suitable for those with a busy life. They are a good natured of dog, and they very eager to please you and to make you happy always. Brussels Griffon are so small for the rowdy children and a young children. They may get good along with other pets when raised with them. They is a barker and they are always enjoys doing so, it is not suitable for the apartment life. Health concerns include reproductive problems and breathing disorders.